We’ve also discussed in another issue how to connect to the OSCOR with Virtual Network Computing (VNC) software for remote monitoring. 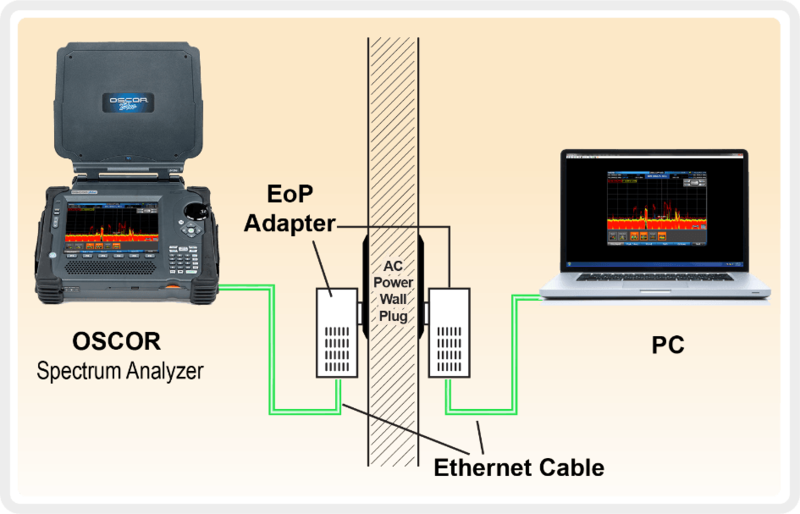 With 3rd party VNC software, an Ethernet cable and a laptop, and a wireless router for wifi connection, the OSCOR can be turned into an in-place RF monitor. This can be useful for monitoring meeting rooms or conference areas for temporary observation. One significant benefit to using the OSCOR in this situation is the OSCOR continuously sweeps a 10 kHz-24 GHz span and is not limited by antenna frequency range. 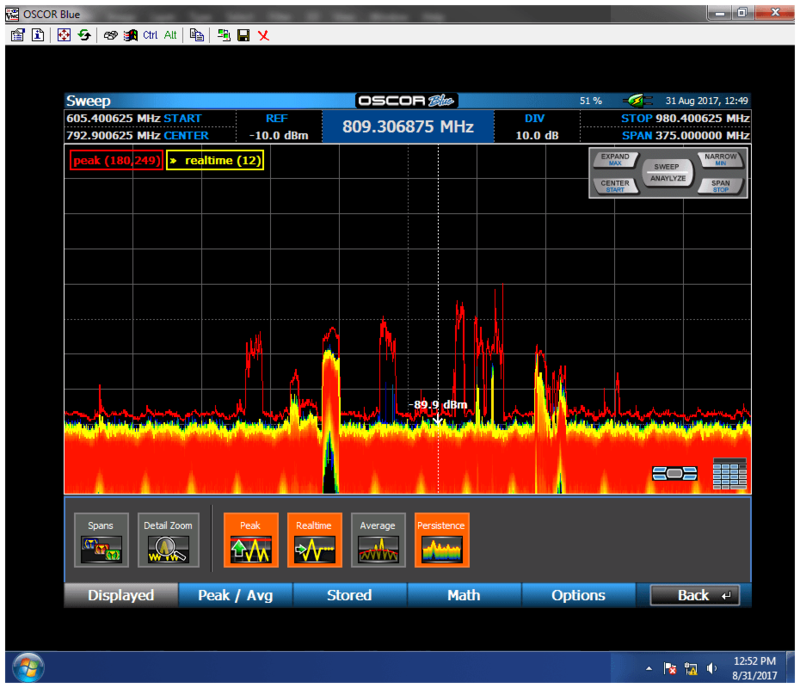 That means you can remotely monitor 24 GHz or zoom to any frequency within the span. In this article we’ll discuss another option for remote in-place monitoring with the OSCOR using existing power lines. Ethernet over Power (EoP) is a way to network computers and home devices using power lines. Sending signals over power lines has been around for many years. In fact, power companies have been sending control signals over powermains since the 1920s and have used this way to determine how they switch to off-peak rates. In recent years, the convenience of wireless networking had almost obscured this medium into obsolescence, but advancements in speed and utility have renewed applications for its use. The powerline network we tested included 2 NETGEAR Powerline 1000 adapters with advertised speeds of 1000Mbps. 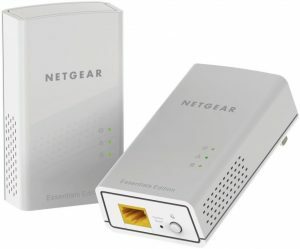 Most adapters support Gigabit-class network capacity and can auto-detect and auto-connect. A pair of Ethernet cables were included. On the PC, we also installed TightVNC Viewer version 1.3.10. There may be other suitable VNC programs, but this is one we had used before and were familiar with. One Ethernet cable connects the OSCOR to one of the powerline adapters. The second Ethernet cable connects the PC to the 2nd powerline adapter. Both adapters plug directly into a wall outlet (the outlets must be on the same phase). An IP address must be acquired on the OSCOR from the System\Network dialog screen. A VNC password must also be set on the OSCOR (must be 8 characters with 1 number and 1 capital letter). Write down or take a picture of this IP address and password and hit “OK” (see below). 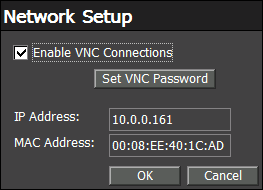 Both the IP address and password must then be entered into the “VNC server” field of the “New Connection” dialog box. Then select “Connect”. A live view of the OSCOR screen should appear in the VNC Viewer with the ability to change views, navigate the menu structure, change between Sweep/Analyzer modes, and control the OSCOR just as if you were sitting in front of it. Trace Record, Spectrogram and waterfalls can all be controlled from the PC. Screen shots can be captured and saved to files and even transferred to the PC through a menu function in the VNC Viewer. The PCs keyboard and mouse make navigation and typing easy. Once the adapters are synced, controlling the OSCOR is simple. OSCOR screen as seen remotely in the VNC Viewer software. Power adapters will not work on filtered power lines. Power adapters must be on the same power phase. While the OSCOR refresh and sweep speeds don’t change, the VNC connection only updates approximately once every 2 seconds. There is a potential for network interruptions, however, the network did reconnect automatically. We also found that adding a router to the network eliminated interruptions. A recording can be made of a suspect signal and saved as a .wav file, then transferred and listened to on the master PC to determine if it is room audio. However, live audio cannot be listened to. The OSCOR is both portable and versatile, and in situations where stationary monitoring is needed, a remote powerline connection may be an excellent solution for concealment, deployment, and detection.